Mohamed Amersi is the Chairman of the Amersi Foundation which supports initiatives in education, building cohesive societies, inclusive capitalism and governance. One of the many noteworthy projects pursued by the Foundation included Extremely Together, a partnered initiative with the Kofi Annan Foundation. Mohamed also launched the Inclusive Ventures Group, a responsible profits social impact investing platform that has invested in education, livelihood, health and waste management in Africa and Asia. 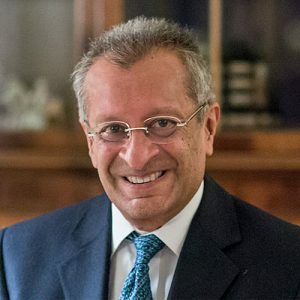 Mohamed Amersi is a Fellow of Brasenose College, University of Oxford and is a member of the Development Board of the British Academy, Boards of Orb Media, Unchain, the Governing Council of the Royal Agricultural University, the Global Leadership Council of the Said Business School, University of Oxford, the Global Advisory Board of the Oxford Foundry. In addition, Mohamed Amersi is the Chairman of the International Advisory Council of the British Asian Trust, the chair of the Advisory Board of Faith in Leadership, a member of the Global Partners Council of the Institute of New Economic Thinking and a Trustee of Prince’s Trust International, the Satyarthi Foundation, the Rose Castle Foundation, the Islamic Reporting Initiative , United We Reach, the Human Thread Foundation and Reboot the Future.